They may have gambling in common, but historic Macau has a genuine heart – and far better cuisine – than its glitzy American desert cousin, writes Jesse Mulligan. I hadn’t expected to like Macau much. When I mentioned to people that I was visiting, they’d inevitably talk about the casinos. “It’s apparently like an Asian Las Vegas,” they’d say, before adding something sniffy like, “fine if you’re into that sort of thing”. The real Vegas didn’t do it for me – once you get over that incredible first sight of neon rising out of the desert it’s really just fat Americans on holiday, isn’t it? 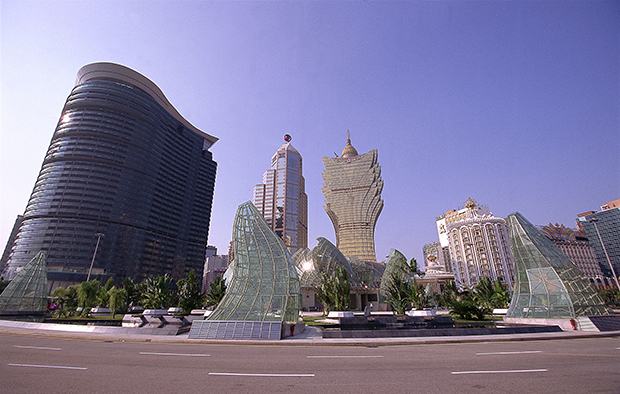 But Macau has what Sin City doesn’t – a rich cultural history, plenty to look at outside the gaming districts, and some good and unique local food. A Chinese territory, Macau was for 400 years controlled by Portugal, and that influence is easy to see in the cuisine. Unlike, say, the English who spent 150 years across the estuary in Hong Kong without managing to get mushy peas onto local menus, the Portuguese contributed to and borrowed from Cantonese cooking to create tasty and memorable hybrids. Years later, in the age of jumbo jets, many authentically Iberian ingredients are now flown in for the local Lisbonese (is that a word? It looks more like a sexual preference when I see it written down) so it’s now actually possible to eat three ways in Macau: Chinese, Portuguese and the crazy mash up known as Macanese. Casinos and hotels are a great place to find very high-end Chinese – at somewhere like Wing Lei at Wynn’s Casino you can sit beneath a giant crystal dragon and eat Michelin-standard dim sum, crispy prawn and their famous baked barbecue pork bun: light, sweet and sticky inside. Likewise, the sprawling, incredible buffet breakfast at my hotel, the Mandarin Oriental, was one of the culinary highlights of the trip, if only for the dumplings. Or, of course, you can grab a cheap bowl of wonton noodle soup and a beer from pretty much any tiny restaurant and it will be good. There’s no bad food in Macau – just a bit of grumpy service – and if you can point to a photo of what you want you’ll be laughing. To go even more low fi, follow Anthony Bourdain to the food carts; there are plenty on and around Avenue De Almeida Ribeiro. One of the best pure Portuguese restaurants is Espaco Lisboa, in Coloane Village, a sweet and tiny little town where it seems like the monster casinos are a thousand miles away. The restaurant does Portugal’s national soup, caldo verde, as well as plenty of potatoes, bacalao (salted cod), goat’s cheese, charcuterie and other things you’d never otherwise expect to see on the coast of the South China Sea. Ask especially to try the ginjinha – sour cherries infused in grappa. It’s also right next to Lord Stow’s Bakery, the justifiably famous home of the Macau egg tart. The titular baker, an Englishman, came up with a local version of the Portuguese tart – an eggy custard baked inside a multi-layered filo shell. His version is notable for a creme brulee-style charring on the top, and they taste as good as they sound. Treat them like Weet-Bix and see how many you can do. A comparatively recent addition, the tart probably doesn’t count as traditional Macanese, but plenty of dishes do. A Portuguese-style fried rice with tomatoes, chorizo and olive is one classic, as is African chicken (introduced by Mozambique soldiers stationed in Macau on behalf of Portugal). You can find these and other pleasures at Cafe Litoral, in the historic Taipa Village just across the bridge from Macau peninsula. Speaking of bridges, China is building one between Hong Kong and Macau; it will be 50km long. Yes, Macau is booming, growing and heaving, with not enough hotel rooms on the weekend for all the mainland Chinese who want to come and play. Yet you’ll stumble upon very charming pockets of daily life that will make you love the place – a park near old town where locals each have a daily spot reserved for tai chi, reflexology or simply reading the paper; a lane a couple of blocks over where thousands of tiny fish dry on racks in the sun; churches and graveyards with understated tributes to the centuries of hardship, illness and death that laid the foundations for the city now crowded with cranes and scaffolding. Macau is not like Las Vegas. It has a heart. That heart has beaten strong for hundreds of years and, despite ongoing changes to the skyline, will continue to make this tiny part of the world worth visiting, so long as you’re into that sort of thing. Getting there: Cathay Pacific has 14 direct weekly flights from Auckland to Hong Kong. A sale on return economy fares at $1379 runs until December 1. Flights connect to the Turbo Jetfoil service running to Macau. Accommodation: Try the Mandarin Oriental Macau. Further information: Visit the Macau Government Tourist Office. The writer flew courtesy of Cathay Pacific and stayed at the Mandarin Oriental Hotel.